Lay-Z-Spa have a good range of inflatable hot tubs that come in a range of sizes and will hold anywhere from 2 adults all the way up to 8. When buying your spa it is important to make sure you have enough room to set up the jacuzzi in your desired location. This table below shows the sizes of all the Lay-Z-Spa hot tub range. 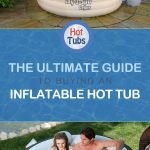 If you would like to find out more about these hot tubs and view there prices then click hot tub title below to find out more.